"Current other income" was $14.7k. I got paid about $2.5k of backpay. 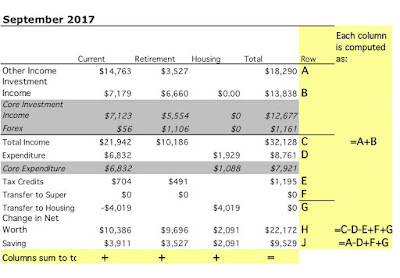 Spending (not counting mortgage) was about the same as last month moderate at $6.8k. Rates (property tax) and the body corporate (condo) fee added more than $1k. 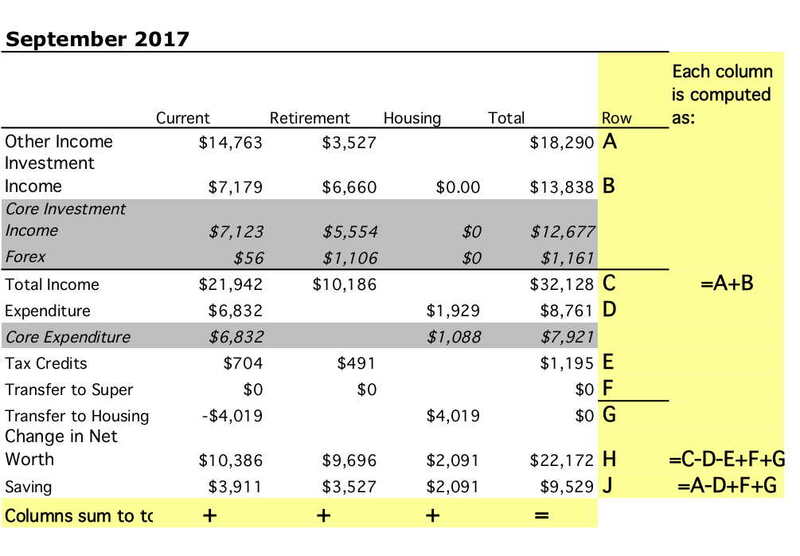 After deducting the mortgage payment of $4.0k (which includes implicit interest saving due to our offset account - the actual mortgage payment was about $840 less than this), we saved $3.9k on the current account and added $2.1k in housing equity. Retirement contributions were $3.5k. Net saving was, therefore, $9.5k across the board. The Australian Dollar fell slightly from USD 0.7922 to USD 0.7839. The ASX 200 lost 0.02%, the MSCI World Index gained 1.97%, and the S&P 500 2.08%. All these are total returns including dividends. We gained 0.97% in Australian Dollar terms and lost 0.09% in US Dollar terms. So, we outperformed the Australian market and underperformed international markets. The best performer in dollar terms was the various Platinum Funds, gaining $6.0k. IPE was the worst performer losing $2.0k. That was the result of a tick down of 0.5 cents in the share price to the bid rather than ask side of the spread. Hedge funds were the best performing asset class in percentage terms, gaining 3.55%. Private equity was the worst performing asset class, losing 4.11%. Commodities were also down, 1.58%. All other asset classes gained. As a result of all this, net worth rose AUD 22k to $1.910 million (new high) or rose USD 2k to USD 1.498 million (also a new high).